I qualified as a Driving Instructor back in the 2000, I’m also with the Institute of Advanced Motorist (RoadSmart) in which I got a first pass mark. As well as teaching people to drive cars, I’ve also been teaching HGV Drivers back down in Kent where I’m originally from. 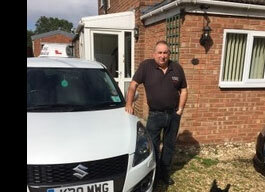 When I was back down in Kent I owned my own driving school, I then moved up to Sleaford in 2017 for a slower pace of life where I can enjoy my passion of cars and spend more time with the family. Talking of family, I’m married to my lovely wife Michelle and have 3 fantastic kids which I’m very proud of. I’m a very chilled character with a great sense of humour! So, if you want to make learning enjoyable, but importantly still cover all the skills needing to make you a safe Driver, then Let U Drive know, you want Mickey.